"If you take care of your fabrics, you won't need to call a Cleaning Company as often... and check a company's credentials before engaging them." The most important maintenance step is proper vacuuming. Regular and thorough vacuuming at least once a week, and more often in heavy traffic areas, will remove soil and dirt particles before they become embedded into the pile of the carpet. Remember .... You can never over vacuum! ... and vacuuming should begin the day the carpet is installed. Professionally cleaned at least once every 12 months or sooner if required. One of the most crucial areas of carpet maintenance is the removal of spots and spills. Acting quickly is the key to success when anything is dropped or spilled and always having the necessary cleaning materials at hand are of the utmost importance. 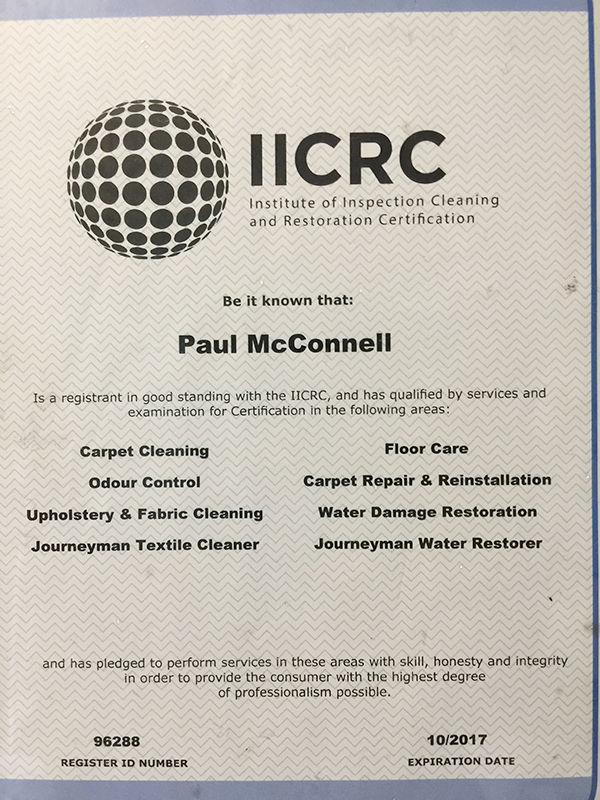 Follow the spotting chart guidelines or refer to a qualified ACCI professional for help. CLEAN - Refer to Spot Removal Chart (below) - follow the steps and apply spot removal agent to clean white towel. Do not apply directly to carpet. RINSE with cold or lukewarm water only WARNING: Do not saturate. BLOT DRY with absorbent material such as white paper towelling or use cold air fan to complete drying. Now match the treatments (below) with the problem spot or stain in this chart. WARNING: Some chemicals are hazardous (corrosive, flammable, toxic etc.) and should be used with great care, strictly in accordance with their use and safety instructions. Detergent Solution ... Mix one teaspoon of clear dish washing liquid (containing no bleaches or strong alkali's) 1 teaspoon of white vinegar with 500 ml of ware (not hot) water. This solution must be well rinsed with clear water. Laundry Detergent ... (non biological) 1 teaspoon in 250 mls warm water. Ammonia Solution ... Mix 1 teaspoon of clear household ammonia with 100 ml of water. Once stain is removed the carpet must be neutralised with vinegar solution. Apply, blot and rinse. Wool and treated nylon carpets are adversely affected by ammonia. Substitute for 2 on chart. Vinegar Solution ... Mix 100 ml of white vinegar with 200 ml of water. Solvent ... A dry-cleaning solvent or solvent substitute e.g. Murlex (available at grocery and hardware stores. Use on dry carpet only.